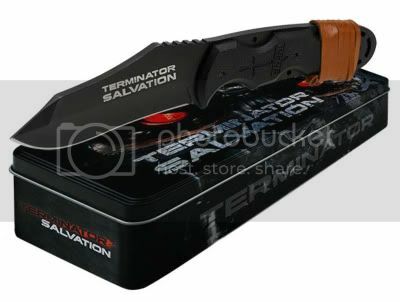 Behold the Terminator Salvation Knife Replica, perhaps the laziest piece of licensed cross-promotional merchandising in the history of ever. I mean, hi. It’s a regular survivalist-type knife. That happens to say “Terminator Salvation” on it. If merchandising were really as easy as slapping the movie’s logo on some object of minor-to-moderate interest from the film, don’t you think the marketers behind The Matrix would have branded their own sunglasses for the undiscerning, consumerist fanboys and -girls of the world? …features a 3 1/2 inch full tang 440 stainless steel blade with a resilient matte black finish, the Terminator Salvation blade insignia and a partially ridged blade back for dexterous maneuverability. The elegantly contoured full tang handle features durable black G-10 handle scales and a brown leather lacing. I don’t know much in the way of knives, but when I hear about that much ‘tang, I fully expect Jamie Lee Curtis’ character from Trading Places to quote me an hourly rate. I like knives. But not that one. Ugly. Are there Terminator-ies who will buy anything branded with the name and dress up as regular looking muscular men and go to conventions? I went knife shopping today and found this knife, I’ve seen the movie and enjoyed it, but i’m not a collector of memorabilia and such. Anyways, the title on the blade is very lame, but holy sh*t, this knife is actually pretty awesome. Its perfectly weighted, heavy, and thick. Its a survival/fighting blade. I plan to find a way to get rid of the movie title, but it is a damn good knife and they should at least get credit for releasing a quality product.